Our Awards sponsors play an essential role in making the Awards possible. 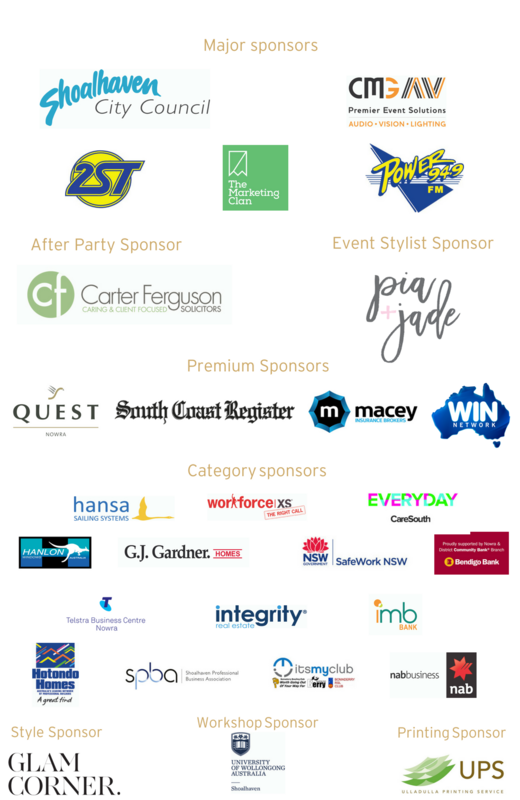 The Shoalhaven Business Chamber would like to thank all Awards sponsors for supporting this important program. Shoalhaven City Council is proud to be a major sponsor of the 33rd Shoalhaven Business Awards. Council is supportive of the local business community and endeavours to provide a platform that both stimulates and supports local entrepreneurial initiative. Improving local and regional infrastructure, providing employment lands, revitalising the local CBDs and facilitating business networking are just some of the outcomes that Council delivers to assist business. By taking advantage of these improvements, businesses can leverage growth in turnover and employment generation. Shoalhaven City Council is again pleased to be able to participate in this event that recognises local business excellence. Shoalhaven is an exciting place not only to live, work and play but also to excel in business. CMG Audio Visual (“CMG AV”) is a best-in-class Audio Visual Hire and Production Services supplier proudly servicing the Shoalhaven, Illawarra and far South Coast. Specialising in value-packed Corporate AV and incredible Live Entertainment solutions, CMG AV offer a unique blend of top-tier Audio Visual equipment, depth of expertise and leading event design technology. Our mission is to go beyond traditional industry benchmarks to create an entirely new level of audience engagement – directly benefiting our clients and event partners through tailored and reliable event solutions that exceed their key objectives and outcomes. This approach is the foundation of our success, enabling us to establish strong, meaningful and value-focused relationships to achieve both the special and spectacular. Speak to one of our expert Team today on 1300 814 568 for an obligation-free event proposal and Quotation. Your best insurance is under the Macey Umbrella. Employing 27 staff, Macey Insurance Brokers is the largest privately owned general insurance broker on the NSW South Coast and has offices in Nowra, Bowral and Camden. We have been providing insurance solutions and advice to individuals and businesses for over forty years. We pride ourselves on finding the right insurance for our customers’ needs and budget, whilst providing outstanding customer service from quote to claim. Power FM and 2ST have been entertaining and informing South Coast and Southern Highland residents and visitors for over four decades. In that time, our services have adapted to cater for an ever increasing and changing audience. Whether it’s news, sport, community events or entertainment, Power FM, 2ST and KIX Country are a voice for the people AND business community of the Shoalhaven and Southern Highlands. Boasting a highly skilled on-air team, creative services, marketing, sales, promotions, digital solutions as well as the successful South Coast Style magazine, we, the South Coast and Tableland Broadcasters are a modern, multimedia business operation. Broadcasting and digital media are a cost-effective advertising and promotional mediums for the rapidly evolving consumer environment and we are technologically equipped to reach and engage with your consumers. The Marketing Clan is a group of advertising, brand and marketing professionals who provide strategic, measurable and creative marketing ideas for small to medium-sized businesses here in the Shoalhaven. Whilst local, we have global experience across continents, markets and brands and can provide effective creative marketing ideas that can help answer business challenges across different industries, whether B2B or communicating directly to consumers. We pride ourselves on delivering creative and cost-effective practical marketing support that helps drive profitable growth. We get to know our clients’ brands and their customers as if they are our own, which makes our clients feel like we are part of their team. The South Coast Register, first published in 1885, is a biweekly newspaper serving readers from Gerringong in the north to Sussex Inlet in the south an area of 4,000 square kilometres. Published Wednesday and Friday and online at southcoastregister.com.au the South Coast Register has strong connections with the Shoalhaven community and is committed to bringing all the local, regional and national news to the region. Wednesday’s edition boasts the comprehensive Domain supplement that is also distributed via participating real estate agents. The South Coast Register is dedicated to supporting our local business community and are proud to partner with the Shoalhaven Business Awards to recognise our region’s successes. The WIN Network is Australia’s largest regional commercial television network, broadcasting to more of regional Australia than any other regional commercial network. WIN broadcasts into 29 markets across six states of Australia, Queensland, New South Wales, Victoria, Tasmania, South Australia, Western Australia as well as the Australian Capital Territory. In all of these markets WIN Broadcasts programming acquired from Ten Network via a program supply agreement, on the following channels; WIN, One, Eleven and WIN HD. WIN also airs two datacasting channels, GOLD and TVSN across its markets. Quest Nowra is the Shoalhaven region’s premier serviced apartment provider. With is modern design and central location, it is an ideal base for a short-term business visit, a relaxed holiday break or a longer-term relocation. Quest Nowra offers a choice of 81 apartments, including studio, one, two and three-bedroom accommodation options. All apartments feature designer-style kitchens and bathrooms, with laundry facilities and balconies for most and all with access to a secure on-site undercover car park. Quest Nowra’s guests enjoy complimentary high-speed WiFi, Foxtel-equipped LED Smart TVs and access to a private gym and BBQ area, as well as a fully-appointed conference room, making it the perfect choice both for business and leisure travellers. Established in 1979, Carter & Ferguson Solicitors is a dynamic firm with extensive experience in providing legal services to the Illawarra and greater New South Wales area. We aim to build close, long term relationships with our clients. We provide clear, practical advice that has your interest at heart while ensuring the law is on your side. Our professional staff will work hard to resolve your legal matter as soon as practicable with the best results obtainable. Pia+Jade are Shoalhaven based Event Stylists, Floral Fairies and Stationery Designers. Specialising in creating beautiful, memorable and inspiring weddings and events, Pia+Jade travel from the South Coast to; the Southern Highlands, Sydney, Hunter Valley, Canberra and everywhere in between. So who is Pia, and who is Jade we hear you ask? No there aren’t two girls behind the business, just Dany and her supportive husband (let’s call him the CFO!). P.I.A were Dany’s late Grandmother’s initials and she named half the business after her as an acknowledgement of the creative inspiration she has been throughout her whole life: unlocking creativity and teaching her a diverse range of skills. Jade is her middle name (super boring story), so it’s kind of like Dany and her Grandmother, carrying on their long crafternoons in spirit. Insert warm and fuzzies here! Dany’s main goal is to make your wedding or event as seamless and stress free as possible! She has years of experience in; Interior Architecture, Events and Hospitality Management, Graphic Design, Floristry, Van Packing Better Than A Tetris Pro, Untangling Fairy Lights 101, not to mention Killer 90’s Dance Moves. You just know you’re going to be in good hands! The Nowra Community® Bank Branch of Bendigo Bank, is operated by a locally owned company, Shoalhaven Community Financial Services Ltd and is managed by a group of dedicated, volunteer Directors who ensure the profits of the business are put back where they belong; to provide support of our local community. The more people who bank with us, the greater the profit we can make and the more we are able support our community. We have all the banking products available, are extremely competitive in our pricing and are very proud of the service provided by the staff to our customers. The Bomaderry Bowling Club was established in 1959 and has steadily grown over the years. Berry Bowling Club amalgamated in 2002, Bomaderry RSL amalgamated in 2014 and Nowra Golf Club amalgamated in 2017. Its my Club is now a group of clubs and shares the one membership. The Bomaderry Bowling Club has a good reputation in catering, Berry Bowling Club has great Chinese food, the Bomaderry RSL is the place for Charity Housie and Club Bingo. The Nowra Golf Club has one of the most scenic golf courses and a club house with the best views of the escarpment and river in the Nowra. From humble beginnings, CareSouth has been serving the Shoalhaven community for 25 years. Emerging as a leader in local business the CareSouth team were immensely proud to be recognised as the 2016 Business of the Year at the Shoalhaven Business Awards. As a local community based organisation with a big heart, we are bold, determined, innovative and never afraid to challenge the status quo. Now covering a footprint over Southern NSW, the completely not-for-profit, CareSouth offers help in a number of ways – through Champions, Brighter Futures, Foster Care, Specialist Youth Support Services, Residential Care, Disability Services, Homework Hub, Family Group Conferencing and Family Contact Services. CareSouth’s vision is to create a positive future for children, young people, individuals, families and communities, providing opportunities in which people can enhance their quality of life. Sean Vickery together with Nathan Fay are G.J Gardner Shoalhaven’s family owned and run local builder in Nowra. Living and working locally gives us great opportunities to contribute to the growth and development of the local community, and also enjoy everything the Shoalhaven has to offer. We come with 30 years’ experience in the building industry, combined with our expert localised knowledge – we are a building team you can trust. Voted No#1 for a second year in a row as best national home builder by Product Review. We diligently select our team based on delivering exceptional service, quality workmanship whilst building and maintaining great relationships throughout the community. G.J. Gardner Homes Shoalhaven are driven by customer satisfaction, upfront communication, honesty and transparency enabling us to deliver exceptional customer service. We regularly partake in community events and fundraisers. We currently sponsor Variety the Children’s Charity, the Lara Jean Association, Van Gogh’s Rugby Union Association and Huskisson Soccer Club. We are always looking for new ways to help grow and support the local community! Hansa Sailing Systems has been designing and building sailboats for 25 years, with over 3000 Hansa sailboats on the water in 35 countries, introducing more than 250,000 people to sailing each year. Hansa’s range of servo controls enable sailors with even the most profound disabilities to sail competitively against anyone in the fleet. The next Hansa Worlds are in Hiroshima in October this year, with over 250 sailors, in 200 boats will be competing. Hansa sailing is an unusual business in today’s world where “the shareholders come first”, as our ethics revolve around the concept that “the more you give away, the more you will receive” and “if you don’t want anything, you can have it all”. Hotondo Homes is a family-owned business that has built its reputation on the quality of its craftsmanship and service. As one of Australia’s leading building franchises, our builders are dedicated to providing a localised customer experience with the support of a national building company. At Hotondo Southcoast, we pride ourselves on our quality of customer service, our workmanship and our local community presence. This commitment led us to be recognised by a number of national and local bodies including the Australian Small Business Awards where we were selected as Champion Trade Service. Our team of dedicated professionals aim to ensure every client not only walks away with their dream home, but also has a smooth building journey. Hotondo Southcoast specialises in building new homes for first, second or third home buyers, investment properties and knockdown and rebuilds. As members of the community we are committed to helping support and grow the local Nowra area. IMB is committed to offering members an alternative to the major banks, offering full-service face-to-face and electronic banking facilities, including home and personal lending, savings and transaction accounts, term deposits, business banking, financial planning and a wide range of insurance products. With a range of business accounts on offer, IMB Business Banking has a team of experienced Relationship Managers on hand ready to help determine the best financial solutions for each unique business. IMB Business Banking can help with a range of competitive and flexible business finance options and offers convenient and easy ways for businesses to transact and stay on top of their accounts to effectively manage cash flow. Whatever business you operate, talk to IMB Bank Business Banking about your business banking needs. nab business Shoalhaven is proud to continue its sponsorship, as well as providing judges for this year’s Awards. We see this as an important part in developing business here in the Shoalhaven. nab business’s strategy continues to have the client at the centre of everything we do and helping them realise their potential. Our locally based Business Banking Managers have the experience, knowledge and authorities to assist local business read their goals. Ably supported by our Associates and Specialist Bankers, our relationship model supports growth through regular and meaningful interaction with our clients. SafeWork NSW is the NSW government agency responsible for working with the community to maintain safe workplaces. Our work includes advisory, education and compliance initiatives to assist in securing the health, safety and welfare of workers in NSW. We are committed to practical, effective and efficient approaches to keeping people safe and businesses productive. We have a small, but dedicated local team of four. providing services to the Shoalhaven and surrounding areas. From our work, it is clear that Shoalhaven businesses are committed to providing safe workplaces. To recognise the efforts of our business community we have partnered with the Shoalhaven Business Chamber and sponsored the inaugural “excellence in workplace safety” award. Our nation-wide Telstra Business Centres provide ongoing support and access to cutting-edge technology to small and medium-sized businesses. We’re ICT experts, dedicated to taking the guess work out of running your local business. Providing installation and maintenance for cloud computing, mobile phones, broadband and NBN-ready digital office systems, we’re your tech experts in Telstra market-leading products and services. We maintain ongoing communication with our customers, understanding that your business needs are as unique as the services you provide. Our team implements a personalised experience to match the individual demands of your business. WorkforceXS Nowra are a team of dedicated, professional and passionate labour hire recruiters tackling the unemployment issues within the Shoalhaven and surrounds with a renewed focus centring on Youth, the new generation of workers. We specialise in fulfilling the requirements and needs of our local community, by matching the skills and expertise of our employees with the workplace needs of our clients. Over the past 4 years our success has grown exponentially, securing stable and ongoing employment for our local workers. We believe our staffing expertise have helped to grow WorkforceXS Nowra into one of the leading recruitment and labour hire businesses on the NSW South Coast. We service businesses from Southern Sydney down to Batemans Bay in a variety of industries including aged care, administration and professional services, civil and commercial construction, industrial and manufacturing. We are a world-class, research-intensive university that provides important opportunities and access to quality higher education, building strong relationships between the university and the local community. Embedded in the University of Wollongong’s curriculum themes, principles and practices is a strong real-world focus to make sure our graduates are career-ready. Graduates from UOW Shoalhaven are globally competitive and can perform highly-skilled jobs in diverse careers, adding to the productive capacity of the economy and long-term growth. They’re also staying local, just like us. UOW Shoalhaven stands for higher education that is achievable, accountable and flexible—good for business and great for our region. We’re leading business and community development in the Shoalhaven. Visit us and find out why.